Hopefully you took advantage of the 'Kaepernick Dip' with me. Now try this options strategy into Nike's earnings report on Tuesday. Her name is Nike, the goddess of victory, according to ancient Greek mythology. It is likely that most young folks today don't know that. They may, however, know Nike (NKE - Get Report) as the athletic shoe and apparel company that signed NFL free agent quarterback Colin Kaepernick to a promotional deal. Almost all sports fans, and folks who pay attention to the news, know Kaepernick as the ballplayer who initiated the "taking of a knee" during the playing of the national anthem. He did this as a way to protest what he and others see as racial inequality in general and more specifically what they see as police brutality. I will never sit or kneel during that anthem, so do not confuse my message here. Nike -- the stock, not the Greek goddess -- has run some 36% this year, and significantly so since the initial selloff that this news event created. Readers of Market Recon are well aware that this column suggested buying the stock that morning, coming off of Labor day weekend, and that the author did buy the shares, as well as sell some put options in order to further drive down net basis costs. Nike understands how their clients think, and what they'll go for. That much, I think is clear. To profit from that relationship, a trader much become mercenary in thought. To be honest, when it comes to making a buck or two, that helps. The truth is that Kaepernick has broken no laws, and has not even done anything unethical. Disrespectful? In the opinion of some, yes. Not so in the opinion of others. The fact is that less than 1% of NFL players are taking a knee this year, so if that is an issue for fans, is not more than 99% pretty darned good? Yes, I think employers have the right to demand and expect certain behaviors to their liking while employees are wearing the employer's uniform. And on their employer's time. That is a policy issue within the bounds of that business. As a fan, I only watch the NFL peripherally -- and that is not a product of any boycott. I just have better things to do on a Sunday. Oh, did I mention that another Nike spokesperson made the news this past weekend? Tiger Woods, remember him? Yeah, I don't watch or play that sport either, but a lot of folks do, and Tiger Woods is their top draw. Woods won his first tournament championship in five years, coming off of several injuries and back surgeries. Is this a positive for Nike? Well, it certainly can't hurt. NKE will report the firm's first quarter after the closing bell Tuesday night. The most important market events of the week are likely the previously mentioned Fed meeting, followed by the Salesforce (CRM - Get Report) Tech conference in San Francisco this week known as "Dreamforce," but the Nike earnings may be the most important earnings release. CRM is an Action Alerts Plus holding. The industry consensus is for an expected EPS of $0.62 on revenue that prints between $9.88 billion and $9.93 billion. There are whispers out there running as high as $0.66. The revenue should be good enough for year-over-year growth of more than 9%. Not impressed? Think about where retail and apparel were in general not so long ago. Make no mistake, this is a success story. My thoughts, back then, were that Nike has a chance to run going into earnings. On top of Nike's history of posting strong Septembers, sales have been strong, and/or growing in recent quarters across Europe, the Middle East, Africa, China and even North America. Margins have shown improvement. In addition, it remains my belief that Nike is ahead of the curve on doing the necessary preparation in reworking supply lines around China, if need be. Okay, so if you listened, you are up. Chart Of The Day: Nike -- What Now? Easily spotted is the "Kaepernick Dip" and subsequent recovery. The lower trend line of the Pitchfork has been regained. The daily MACD and Relative Strength Index both remain very positive. But allow your eyes to gaze to the Money Flow indicator below the chart, and you'll see no recovery at all since the Kaepernick news. That's a little odd. If you're like me, and you did buy the shares on that dip for a trade, then you'll be looking to protect profits now. Personally, I am up 9.3% in less than three weeks on this one. I will be taking some off ahead of the numbers. I am in a different position than someone coming in flat. For those also looking to protect "this house" at the expense of a limited debit, there is a way to go, without selling any equity. Let me explain. --Assumes an equity long position of 100 shares -- and the need to protect recent gains, without necessarily selling the shares. --Sell (write) one Sept 28 $81 put option (last: $0.78). This will cost the trader a net outlay of $160. Should the shares rise in value into this Friday, these options contracts will expire worthless. The trader has maintained ownership over all of his or her shares. Should the shares decline in value into this Friday, the trader would be able to sell the shares at $85.50, and were the decline to reach the $81 level, that is where the trader would be required to buy back the shares, realizing a net capital extraction of $290, after the already mentioned outlay. This strategy is known as a "Bear Put Spread." 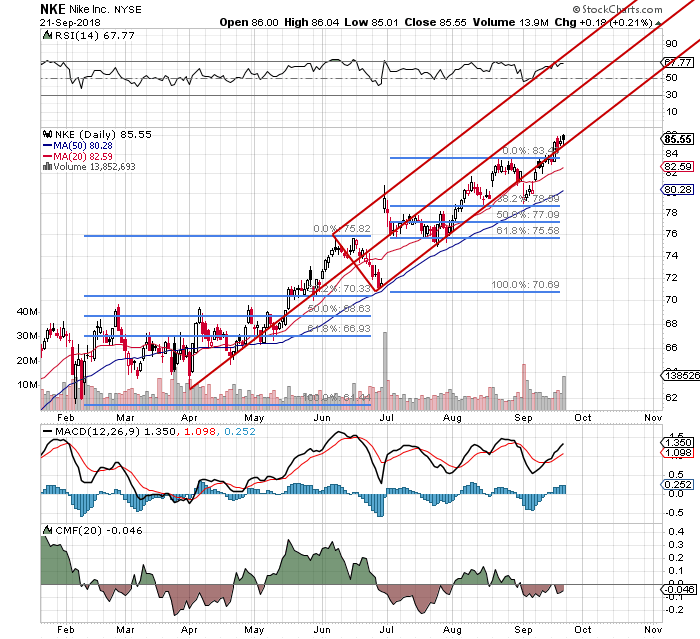 At the time of publication, Guilfoyle was long CRM, NKE equity. Short NKE put options.